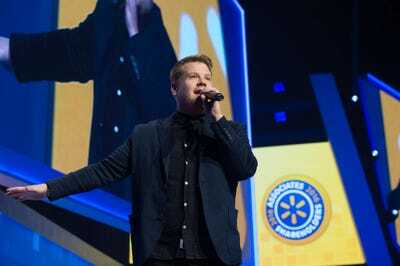 WalmartJames Corden of ‘The Late Late Show’ was the 2016 Walmart Shareholders Meeting host. 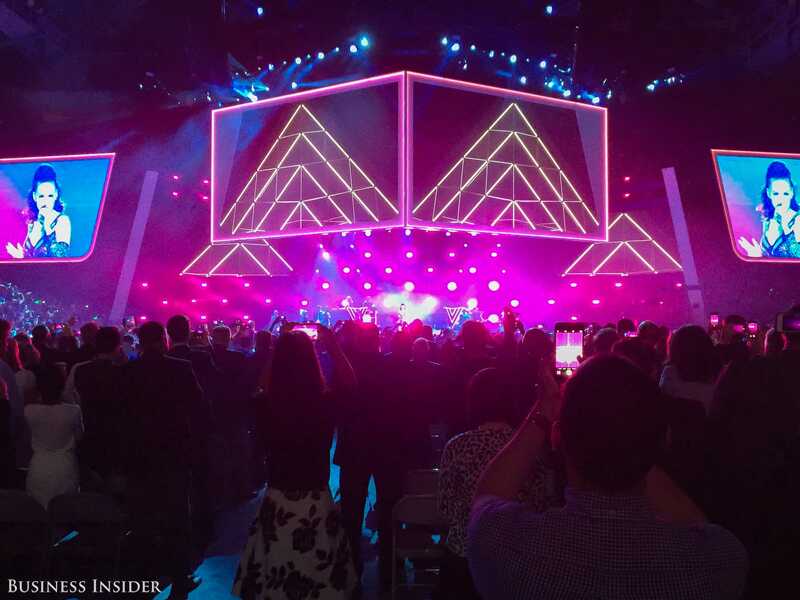 Right around 8:00 a.m. Friday morning, “The Late Late Show” host and viral sensation James Corden entered the stage at the Bud Walton Arena at the University of Arkansas, to a crowd of more than 14,000 people from around the world gathered for the annual Walmart Shareholders Meeting. “Walmart is the definition of Americana, isn’t it?” he said, before taking turns playfully roasting the executive team (for chairman Greg Penner, husband of Walmart founder Sam Walton’s granddaughter Carrie Walton Penner: “He worked tirelessly — at marrying Rob Walton’s daughter”). He also extolled Walmart’s successes in between jokes, of course. To wrap the event a few hours later, Katy Perry came out with a full light show to perform a few of her biggest hits. She was preceded by performances from Nick Jonas, Maxwell, and Jordan Smith. Under normal circumstances, this lineup would come with a sizable bill, but all of the performances were free, as they always are at the Walmart Shareholders Meeting. Richard FeloniKaty Perry gives the closing performance at the 2016 Walmart Shareholders Meeting. And for Walmart, the celebration isn’t contained to just Friday. 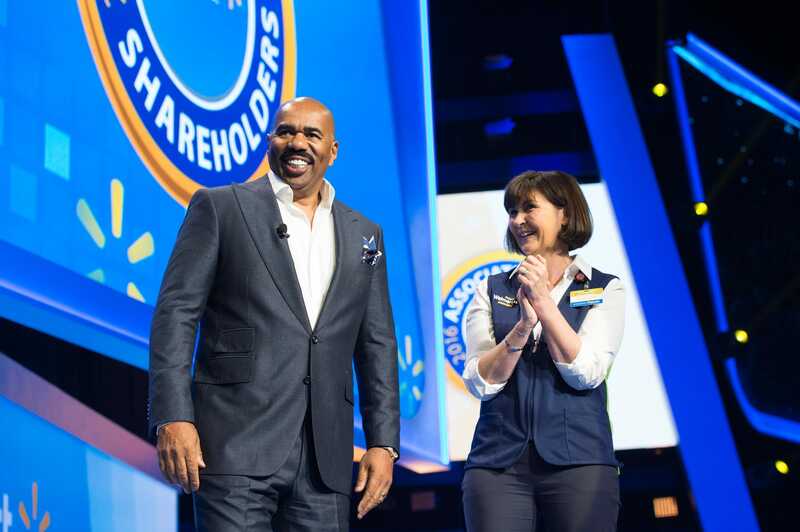 In a series of events for Walmart employees and the media on Wednesday and Thursday, celebrity chef Robert Irvine showed up at Walmart’s Culinary Center, television personality Steve Harvey played a game of Family Feud with Walmart executives and employees, and Daughtry and Three Doors Down performed at a full-blown concert. In the past three years, celebrity guests and performers included Reese Witherspoon, Mariah Carey, Pharrell Williams, and Tom Cruise. WalmartSteve Harvey, standing next to Walmart COO Judith McKenna, made a guest appearance during Walmart’s Shareholders Week. Walmart is the world’s biggest retailer, bringing in $482 billion in revenue in its latest fiscal year, and has developed longstanding relationships with top entertainment companies. During this year’s concert, both Daughtry and Three Doors Down’s frontmen thanked Walmart for selling millions of their albums, and plugged their latest releases. A few of the celebrities had some fun with the unusual circumstances around their appearances. Harvey told the crowd he wasn’t being paid for his appearance, but as the author of three books sold in Walmarts, he had some advice. “If you want to increase traffic in Walmart, you need to put lots of pictures of me around the stores,” he said.